George Washington - Student of Ernest Clarke and Walter Damrosch, New York Conservatory. Staff arranger for Irving Mills. During 30's played with Don Redman, Benny Carter, Fletcher Henderson, Louis Armstrong. J.C. Higginbotham - Perhaps the most influential trombonist of the era. A major contributor on many important 1930's recordings with Red Allen, Coleman Hawkins, and Louis Armstrong. During 30's played with Luis Russell, Benny Carter, Fletcher Henderson, Louis Armstrong. Close friend and companion of Red Allen. Wardell Jones - Played with Bill Brown, Bingie Madison, Benny Carter, 'Fats' Waller, 'Hot Lips' Page. Shelton Hemphill - A member of Horace Henderson's Collegians while a student at Wilberforce College. 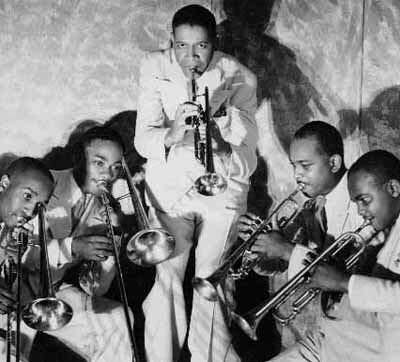 In 30's N.Y. played with Chick Webb, Louis Armstrong, Duke Ellington (long tenure). His lead trumpet playing can be heard to good effect on many 1930's recordings. Satchmo's favorite lead trumpet. During the 50's, George Washington often played in California with Abraham Lincoln - a well-known trombonist who was featured at the Sacramento Dixieland Jubilee in 1976. On the way home from a gig one evening, they were stopped for a traffic violation and Abe showed his license to the cop, who, pointing to George, responded "...and I suppose you're goin' tell me that's George Washington." "Well, yes it is, officer." So, Abe and George spent the night in jail. [N.B.] Abe Lincoln can be heard on Bobby Hackett's Coast Concert recordings (1955). Story related to Jack Bradley by Abe.